This weekend, millions of fans worldwide will descend upon the local multiplex for the latest offering in Peter Jackson’s epic trilogy interpretation of J.R.R. Tolkien’s fantasy adventure The Hobbit. While it’s for others to decide whether Jackson’s film is a worthy interpretation, one thing is clear: readers have been finding inspiration, imagination, and even spiritual nourishment in the pages of Tolkien’s classic since it was first published in 1937. 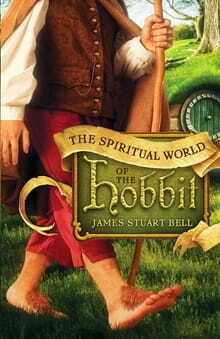 Presumably released to coincide with the second installment in Jackson’s trilogy, James Stuart Bell’s The Spiritual World of the Hobbit serves as a nice one-stop volume for those seeking a bit of knowledge, light literary criticism, and some enlightened thoughts on how Christians can gain spiritual encouragement from the example of Bilbo Baggins’ quest. It should probably be noted up front that how you respond to Bell’s book will depend largely on your familiarity with, and love for, Tolkien’s work. Those with a great deal of both might find Bell’s book either a repeat of what’s already known, or, worse, an infringement on deeply-held beliefs about The Hobbit. However, those with a cursory knowledge of The Hobbit - perhaps those picking up Tolkien’s book for the first time, or those looking to after seeing the first movie - this book is an acceptable companion to a first read. Bell speaks in generalities, and does quite a bit of interpreting the story elements from a Christian perspective. Again, for that reason, this book might prove to be polarizing; readers who are generally miffed by the thought of others “finding” spiritual meaning in works of fantasy or speculative literature will likely be equally miffed by this book. Stories aren’t obligated to explain themselves, and someone who tries will likely be delving too deeply into material that wasn’t meant to be mined that way. Yes, yes, that is true. And, indeed, in some ways, Bell uses the Hobbit as a pastor might for a sermon illustration, drawing inspirational guidance from Bilbo’s character traits, conflict, and eventual resolution. For that reason, this book’s goal is accurately described as helping the reader “find wisdom and inspiration in one of the greatest adventures ever told.” And that, regardless of your perspective, seems like a worthy endeavor. People have been doing that ever since the first fireside hunting tale was told. In this way, The Spiritual World of the Hobbit meets its goal: a devotional/inspiration book for Hobbit readers. And, with duck hunters, football fans, and dozens of other niche groups having devotional books which appeal to their particular interests, why not Tolkien-lovers? With the holiday season upon us, this book might just find its place inside a stocking next to the dwarf-shaped Pez dispenser.